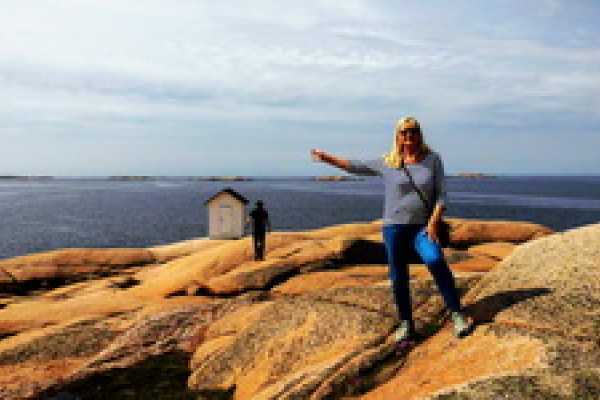 - your guide to sea and rock, herring and granite, history, adventures and experiences in Lysekil, Stångenäset and in the "Granite kingdom". Here are a number of complete tours on Stångenäset, Skaftö and Lysekil. Time and content can be varied depending on the group's interest and size. If you are looking for something further, the trip can be modified as desired. Get inspired! Take a guided trip to one of the islands in our lovely archipelago. Take a slower cruise in quieter waters or experience the spark's sparkling and waves splashing on the way to Stora or Lilla Kornö. A boat trip through Lysekil's northern archipelago. Join a breathtaking beautiful trip in the border between nature and culture, truth and poem, dream and reality. During the Bronze Age, the sea level was 10-15 meters higher than today. Rock carvings are found in the old farms around Lyse, Brastad and Bro churches. The rock carvings in Backa belong to the earliest discovered in Sweden. Here is life of the past: horse and ox drawn carriages, sun symbols, wild and domestic animals and ships from different ages. During a very limited period, demand for cut-out granite grew rapidly. When the economic crisis struck in full force around 1932, about 50% of the working population in Brastad's municipality was dependent on the stone industry! The oldest, more permanent settlement was built here, right next to the water, in the end of the 16th century. Here, all the fishermen and ships of the city lived when Bohuslän became Swedish and until Lysekil became a borough in1836. Most houses along the new posh street, Kungsgatan, were not built until the latter half of the 19th century. Along this was the new bank house, hotel, Stadsparken, telegraph station, town hall / townhouse and magnificent private homes. We show some of the buildings, summer cottages, boarding houses and bathing facilities from the sea resort era. The big cold bathhouse is still there, as is the sea resort restaurant and the house for the genty's social gatherings in the old seaside park. Under 1900-talet går Lysekil från att vara ett skepparsamhälle till att bli en utpräglad industristad med allt vad det innebar. Detta tema förtjänar en egen tur, som kan göras till fots eller ännu hellre, med hjälp av cykel.